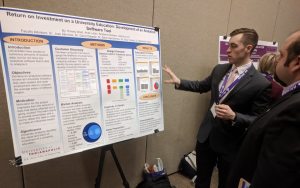 Twenty engineering students and ten engineering faculty attended the American Society for Engineering Education (ASEE) Illinois-Indiana Section Conference for 2019 hosted by the University of Evansville in March. 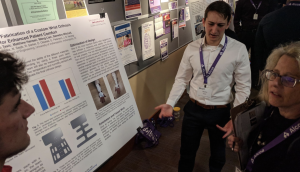 “It was a great experience to be able to share our project with other engineering professionals and experts,” said Marko Tasic ’21 (industrial and systems engineering). Students participating in the conference are from the sophomore level ENGR 298 – Engineering Design Lab IV and junior level ENGR 398 – Engineering Design Lab IV, both core classes of the DesignSpine curriculum that emphasizes project-oriented courses with practical, hands-on experience and collaboration on real-world projects. Joseph B. Herzog is the lead instructor and course coordinator for ENGR 298 and David Olawale is the lead instructor and course coordinator for ENGR 398. Teaching both of these courses is a team effort from all of faculty in the R.B. Annis School of Engineering. Student teams meet with engineering faculty members each week to discuss project status and also consult with faculty outside of class time for technical assistance. “What I love about this class is that when I walk into the machine shop during the class period, I see a diverse group of students working on multiple different projects. Some students are welding, others are cutting steel, and others are working on the mill. This is a great experience that connects students with external customers, enables students to use their technical engineering skills to design the project, but also give students the opportunities for hands-on work, that will make them better engineers,” Herzog said.